The long-running Mazda MX-5 Miata remains one of the top roadsters on the market and makes its way into 2014 completely unchanged. With 25 years in production this model year, the Miata has very little to prove, carrying on its legacy as an affordable, responsive, fun-to-drive sports car. Its mechanics are impressive and can be attributed to the vehicle's sharp handling, and high-end performance. Offered in three trim levels, base Sport, Club and Grand Touring, the Miata is also available with a significant amount of features buyers are sure to love. 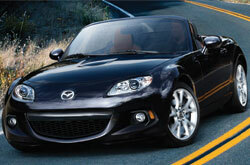 Want to learn more about the2014 Mazda MX-5 Miata in Houston? Read our short overview below, then continue further down for additional details and specs. Offered solely in rear-wheel drive, the 2014 Mazda MX-5 Miata comes equipped with a 2.0L inline four-cylinder engine, producing 167 horsepower and 140 lb.-ft. of torque. All models sport either a standard five-speed manual (Sport) or a six-speed manual transmission (Club and Grand Touring), but a six-speed automatic is an available option. For those who choose to take advantage of the automatic, it is worth noting that horsepower is reduced to 158. Aside from its powertrain, the convertible features a responsive suspension, which helps produce quick steering and handling - admired qualities in Edmund's 2014 Mazda MX-5 Miata review. Three trim levels, the Sport, Club and Grand Touring, make up the 2014 Mazda MX-5 Miata in Houston and each one offers an array of features buyers are guaranteed to enjoy. On the base Sport model, drivers are greeted with power windows, a six-speaker audio system, a leather-wrapped steering wheel, a glass rear window and fog lights, while Club model owners receive 17-inch wheels, keyless entry, a trip computer, steering-wheel-mounted controls and a leather-wrapped shift knob - mentioned in various 2014 Mazda MX-5 Miata reviews. The top-of-the-line Grand Touring edition boosts the Miata's appeal even more, providing in-car occupants with heated seats, leather upholstery, automatic climate control, a seven-speaker Bose stereo system and an auto-dimming rearview mirror. 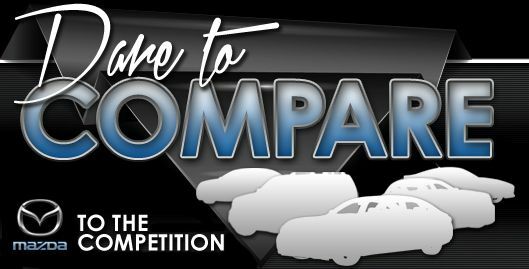 When you compare Mazda's most current MX-5 Miata model side-by-side with the 2014 Mini Cooper, Fiat 500 and the Ford Mustang, you'll discover that it ranks above the competition. With useful cabin amenities and an attractive design, shoppers will love the MX-5 Miata. You'll easily see that when compared to the aforementioned vehicles it's a fabulous value in regard to price, which is why many Houston Mazda customers choose it. Browse our MX-5 Miata Facts list; look just below this text for bullets. Thank you for reading Joe Myers Mazda's 2014 MX-5 Miata review! We take our responsibility to provide the best reviews transcribed by automotive experts - it's just one more thing that makes us a well-known Mazda retailer in Houston. Filled with up-to-date information and specs, each overview gives you complete details about all the MX-5 Miata has to offer Houston drivers in terms of fuel economy and much more. Find out all about our entire selection of incredible automobiles! If the MX-5 Miata isn't the right pick for you, we've got many other Mazda reviews and car comparisons. Visit our research index to view them now!